At the back of a cluttered office, Karim Jivraj opens a box of newly delivered campaign pamphlets to see a picture of his youthful face smiling back. At twenty-eight, he is an unlikely candidate to be running for the Conservative Party in Toronto’s University–Rosedale. It’s a riding his own party considers unwinnable, carved from two historically Liberal and NDP enclaves of Toronto Centre and Trinity–Spadina. “I’ve had my eye on federal politics for a while. It’s not like it’s an accident,” he says. Since January, Jivraj has been on a leave of absence from his job in a corporate law firm, gradually building political support. But before he began wooing wealthy liberal voters, he first had to win the nomination against the Conservative Party’s handpicked candidate, former Toronto District School Board committee member Sabrina Zuniga. After weeks of door-to-door canvassing and speech-making, he won the nomination handily. It’s a sunny Sunday morning, one week before the election, and Jivraj and his university-aged campaign manager, Kary Cozens, and are heading out to drum up votes in one of Canada’s wealthiest neighbourhoods. The first house we come to is an enormous red brick structure; two stone gate posts flank a driveway that leads to a manicured garden. “They say that you get tougher knuckles by knocking on doors,” Jiviral says. “But Rosedale’s the exception: Everyone has door knockers made of brass.” On a wall, a sign reads: “Maserati Parking Only.” And in the drive, a glossy black Maserati sports car is parked. “Really trying to shake the stereotype, eh? ” Jivraj says with a laugh. It’s a milieu he’s comfortable in. Though he grew up in a modest house in North York, he attended the Toronto French School, a prestigious private international school. His parents immigrated to Canada during the height of Trudeaumania, and were determined that their children would become good Canadians. So, instead of teaching him Gujarati or Hindi, they made sure that their son learned French, bridging together the two identities that then defined federal politics. Walking along the leafy streets in Rosedale, it’s easy to imagine that little has changed since then: everyone we meet appears to be over forty and white. Early on, we pass a silver-haired British couple, out for a stroll. Jivraj introduces himself, and the woman looks him up and down. “Are we getting older, or are they getting younger? It’s getting ridiculous,” she says. Jivraj asks if he has their support. “No, and I’m afraid we’ve already voted,” the man replies. It’s a common refrain, with advance voting well above 2011 numbers. Jivraj struggled to make sense of why people had a hard time believing he was Canadian. Most insisted he was Arab. (His parents are Ismaili Muslims from East Africa who fled the instability and anti-Asian racism of the 1970s.) “I remember the first couple times I said naively, What does a Canadian look like? And eventually it dawned on me,” he says. Far from home, Jivraj became obsessed with the question of identity, cutting class to read books that tried to define the Canadian experience. “I know for me, to look at Canada from the outside was a formative experience,” he says. “And a lot of people are surprised that I ended up being a Conservative because of that, as compared to being a Liberal. What pushed me to conservatism was the idea of identity.” Jivraj feels that Thomas Mulcair and Justin Trudeau don’t understand how intense the conflict between moderate and radical Muslim communities has been. “How about a federal government that wants to help preserve a Canadian Islam, true to its origins and progress over the years? ” he asks rhetorically. As we make our way from house to house, a Range Rover pulls up to the curb. A man in tennis whites leans over from the driver’s seat. “You know your stuff, you speak very well,” he says to Jivraj. He’s congratulating the candidate on his recent performance at the Rosedale Residents’ Association Candidates Debate, an event Jivraj says is typically a “liberal love-in.” This year, though, he’s made an impression. In a riding the Conservatives feel is a write-off, Jivraj says, he has canvassed relentlessly and attended every possible debate in order to raise his profile. It seems to be working. “Make sure you got your five hundred dollars from me,” the man says before he drives off. Though you would think that his campaign would be awash in money from Rosedale’s well-heeled conservatives, Jivraj says that it’s not the case. Due to the $1,500 limit to personal campaign contributions, much of that cash has already been spoken for, with Conservative candidates elsewhere treating this wealthy enclave like a bank account. Jivraj came late to solicit donations, and found little left in the coffers. A middle-aged woman opens the next door down the street. “Have you decided who you’re going to vote for? ” Jivraj asks. “Well, it’s between you and the Liberals,” she says. This is exactly the kind of person Jivraj wants to be speaking to: “Blue Liberals,” he calls them, people who are socially liberal but fiscally conservative. He launches into the pro-business policies of the Conservative government: low taxes, the Trans-Pacific Partnership, support for small businesses. She seems receptive, but not convinced. She’s tired of Stephen Harper. “Look, people like Justin Trudeau. But as much as we like this young man who’s full of hope, it’s not about personality. It’s about what life’s going to be like in four years,” he says. 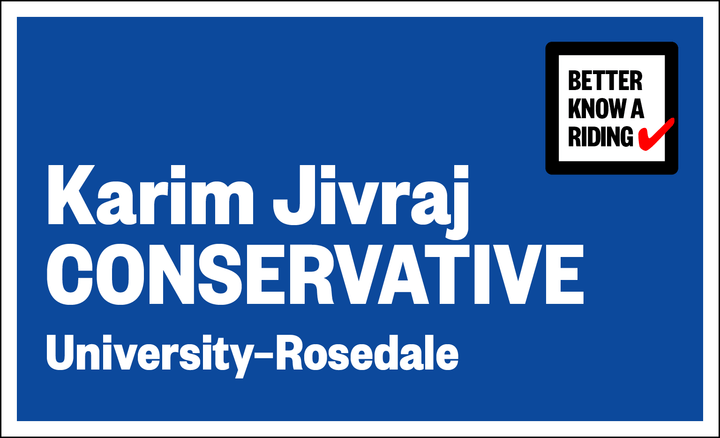 Many Liberal and NDP voters in University–Rosedale may feel the same way about Karim Jivraj.